Harare (formerly Salisbury) is the capital of Zimbabwe. It lies in the northeastern part of the country at an elevation of 1,483 meters (4,865 feet), and has a warm temperate climate. Administratively, Harare is an independent city equivalent to a province. A modern, well-planned city with multi-storied buildings and tree-lined avenues, Harare is Zimbabwe's largest city, as well as its administrative, commercial, manufacturing, communications, and education center. It serves as a distribution point for the surrounding agricultural and gold-mining areas. Numerous suburbs surround the city, retaining the same names colonial administrators gave them during the nineteenth century, such as Warren Park "D," Borrowdale, Mount Pleasant, Marlborough, Tynwald, and Avondale. While Harare is modern and well-planned and plays an essential role within Zimbabwe, it must also resolve the problems found within the nation. These include the highest mortality rate among all African nations and very high incidences of HIV/AIDS infection. Zimbabwe has the highest literacy rate of all African nations with a strong foundation of education and abundance of natural resources, all of which are assets that can be used toward the nation's progress and prosperity. 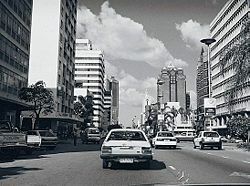 The name Harare derives from the Shona chieftain Neharawa, who with his people occupied the area known as the Kopje (pronounced "Koppie"), near where the commercial area developed. Before independence, "Harare" was the name of the Black residential area now known as Mbare. Harare is situated in the northeastern part of Zimbabwe in the uplands at an elevation of 1,483 meters (4,865 feet). Harare has a warm temperate climate. Its high altitude and the prevalence of a cool south-easterly airflow maintains temperatures that are rather low for the tropics. The average maximum daytime temperature in January (midsummer) is 77°F (25°C), dropping to an average maximum of around 68°F (20°C) in July. There are three main seasons—a warm, wet season from November to March/April; a cool, dry season from May to August (corresponding to the Southern Hemisphere winter); and a hot, dry season in September/October. The average annual rainfall is about 32.4 inches (825 mm) in the southwest rising to 33.6 inches (855 mm) on the higher land in the northeast. The climate supports a natural vegetation of open woodland. The most common tree of the local region is the Msasa Brachystegia spiciformis that colors the landscape wine-red with its new leaves in late August. An introduced tree that contributes most to the town's atmosphere is the Jacaranda (a South American species) that produces a burst of lilac when it blooms in September. 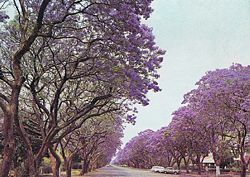 Jacaranda trees in Montagu Ave, Harare, in 1975. Iron Age Bantu-speaking peoples began migrating into the area known as Zimbabwe perhaps as far back as two thousand years ago, including the ancestors of the Shona, who account for roughly four-fifths of the country's population today. From 1250 to 1629, the Mutapa Empire, which stretched between the Zambezi and Limpopo Rivers of Southern Africa in the modern states of Zimbabwe and Mozambique, traded gold, ivory, and copper for cloth and glass with Muslim merchants on the Indian Ocean coast. From c. 1250–1629, the area that was to became Zimbabwe was ruled under the Mutapa Empire, which was renowned for its gold trade with the Arabs. The Mutapa Empire founders were culturally and politically related to the builders who constructed Great Zimbabwe, the name given to hundreds of great stone ruins spread out over a 200 square mile (500 km²) area within the modern-day country of Zimbabwe. The Portuguese dominated much of southeast Africa's coast by 1515, seeking to dominate the trade with India. In 1834, the Ndebele people arrived from south of the Limpopo River while fleeing from the Zulu leader Shaka (1787–1828), making the area their new empire, Matabeleland. In 1837-1838, the Ndebele conquered the Shona, and forced them to pay tribute and to concentrate in northern Zimbabwe. In the 1880s, the British South Africa Company, owned by English-born businessman, mining magnate, and politician Cecil Rhodes (1853–1902), arrived in the area. In 1890, the city was founded as a fort at the spot where the British South Africa Company’s Pioneer Column, a military volunteer force of settlers organized by Rhodes, halted its march into Mashonaland, a region in northern Zimbabwe, the home of the Shona people. The city was originally named Fort Salisbury after Robert Arthur Talbot Gascoyne-Cecil, the Third Marquess of Salisbury, who was then British prime minister, and it subsequently became known simply as Salisbury. Salisbury was declared a municipality in 1897. 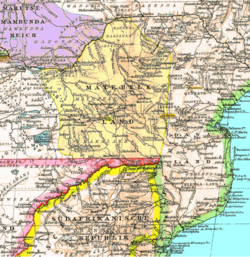 In 1898, the name Southern Rhodesia was adopted for the territory. When the railway arrived from Beira (Mozambique) in 1899, the town developed as a trading center. The United Kingdom annexed Southern Rhodesia from the British South Africa Company in 1923, and Salisbury became the capital of the British colony. It became a city in 1935. Industrialization during World War II and after attracted an influx of migrants. The city was the capital of the Federation of Rhodesia and Nyasaland from 1953 to 1963, and from then was the capital of Southern Rhodesia. A 1961 constitution was formulated that favored whites in power. The government of Ian Smith (1919–2007) declared Rhodesia independent of Great Britain on November 11, 1965. The United Kingdom did not recognize the act and demanded more complete voting rights for the black African majority in the country. United Nations sanctions and a guerrilla uprising led to free elections in 1979, and independence as the Republic of Zimbabwe in 1980. 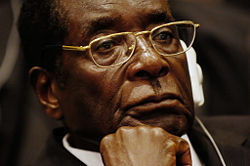 Robert Mugabe (b. 1924), a former schoolteacher whose goal was to replace white minority-rule with a one-party Marxist regime, became the nation's first prime minister, and remained the country's only ruler, as president since 1987. The capital city retained the name Salisbury until April 18, 1982, the second anniversary of Zimbabwean independence, when it was changed to Harare. Mugabe's chaotic land redistribution campaign, which began in 2000, caused an exodus of white farmers, crippled the economy, and ushered in widespread shortages of basic commodities. Ignoring international condemnation, Mugabe rigged the 2002 presidential election to ensure his re-election. The ruling ZANU-PF party used fraud and intimidation to win a two-thirds majority in the March 2005 parliamentary election, allowing it to amend the constitution at will and recreate the Senate, which had been abolished in the late 1980s. In April 2005, Harare embarked on Operation Restore Order, ostensibly an urban rationalization program, which resulted in the destruction of the homes or businesses of 700,000 mostly poor supporters of the opposition. This caused a sharp reaction in the international community because it took place without warning and no plans were made to provide alternative housing. This was followed by Operation Chikerema (Operation "Better Living") a year later which consisted of building concrete housing. Critics stated that these were inadequate citing the lack of electricity, plumbing or other infrastructure in poorly accessible areas. Mugabe, in June 2007, instituted price controls on all basic commodities causing panic buying and leaving store shelves empty for months. The political and economic crisis plaguing Zimbabwe has harmed Harare. A government-appointed commission replaced the elected council for alleged inefficiency, although essential services such as rubbish collection and street repairs have rapidly worsened, and are now virtually non-existent. 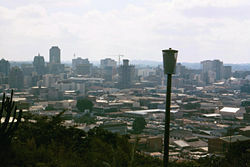 In May 2006, the Zimbabwean newspaper the Financial Gazette described the city as a "sunshine city-turned-sewage farm." General elections held in March 2008 contained irregularities but still amounted to a censure of the ZANU-PF-led government with significant gains in opposition seats in parliament. Movement For Democratic Change opposition leader Morgan Tsvangirai (b. 1952) won the presidential polls, and may have won an outright majority, but official results did not reflect this. In the lead up to a run-off election in late June 2008, considerable violence enacted against opposition party members led to the withdrawal of Tsvangirai from the ballot. Extensive evidence of vote tampering and ballot-box stuffing resulted in international condemnation of the process, and calls for the creation of a power-sharing government have been ignored. Zimbabwe is a parliamentary democracy in which the president, who is both the chief of state and head of government, is elected by popular vote for a five-year term, and has no term limits. The bicameral parliament consists of a Senate of 93 members, and a House of Assembly of 210 members. 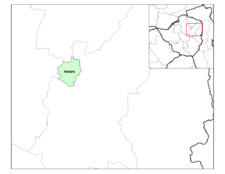 Zimbabwe is divided into eight provinces and two cities with provincial status. These are territorial divisions for the purposes of administrative, political and geographical demarcation. The provinces are subdivided into 59 districts and 1200 municipalities. Administratively, Harare is an independent city equivalent to a province. Harare has been the location of several international summits such as the Eighth Summit of the Non-Aligned Movement (1986) and Commonwealth Heads of Government Meeting (1991). The latter produced the Harare Declaration, dictating the membership criteria of the Commonwealth. In 1995, Harare hosted most of the Sixth All-Africa Games, sharing the event with other Zimbabwean cities such as Bulawayo and Chitungwiza. Downtown Harare, Reserve Bank ahead. The government of Zimbabwe in 2008 struggled with an unsustainable fiscal deficit, an overvalued official exchange rate, hyperinflation, and bare store shelves. Its 1998-2002, involvement in the war in the Democratic Republic of the Congo drained hundreds of millions of dollars from the economy. The government's land reform program, characterized by chaos and violence, has badly damaged the commercial farming sector, the traditional source of exports and foreign exchange and the provider of 400,000 jobs, turning Zimbabwe into a net importer of food products. The European Union and the United States provide food aid on humanitarian grounds. Badly needed support from the International Monetary Fund had been suspended because of the government's arrears on past loans and the government's unwillingness to enact reforms that would stabilize the economy. The Reserve Bank of Zimbabwe routinely prints money to fund the budget deficit, causing the official annual inflation rate to rise from 32 percent in 1998, to 133 percent in 2004, 585 percent in 2005, passed 1,000 percent in 2006, and 26,000 percent in November 2007. Due to the unstable economic conditions and failure to control inflation, economists have suggested that the Reserve Bank be reformed. Zimbabwe's per capita GDP was estimated at $200 in 2007. 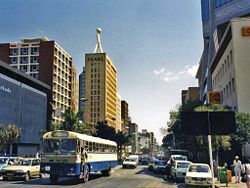 Harare is Zimbabwe's largest city, as well as its administrative, commercial, manufacturing, communications, and educational center, and serves as a distribution point for the surrounding agricultural and gold-mining areas. The city is a trade center for tobacco, maize, cotton, and citrus fruits. Manufactures include textiles, steel, and chemicals. Factories produce processed food, beverages, clothing, cigarettes, building materials, and plastics. Gold is mined in the area. Harare is a hub of rail, road, and air transport in Zimbabwe. The public transport system of buses, run by ZUPCO crumbled in the first decade of the twenty-first century. Privately owned companies that operate commuter omnibuses proliferated. With a fuel crisis, the government introduced commuter trains in order to ease transport shortages. The National Railways of Zimbabwe operates a daily overnight passenger train service from Harare to Mutare and another one to Bulawayo. 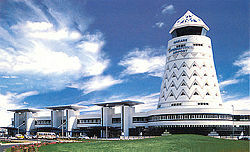 Harare International Airport is Zimbabwe's main airport. 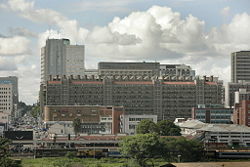 Harare had an estimated population of 1,600,000, with 2,800,000 in its metropolitan area in 2006. There has been an increasing flow of Zimbabweans into South Africa and Botswana in search of better economic opportunities. Black Africans make up 98 percent of Zimbabwe's population. Shona comprise 82 percent; Ndebele 14 percent; other two percent; mixed and Asian one percent; and white, fewer than one percent. English is the official language, while Shona, Sindebele (the language of the Ndebele), and numerous but minor tribal dialects, are spoken. About half of Zimbabwe's population follow syncretic religions which are part Christian, part indigenous beliefs. Christians make up 25 percent, those following indigenous beliefs 24 percent, Muslim and other, one percent. Harare is the site of the University of Zimbabwe, the largest and most complete institution of higher learning in the nation, about three miles (five kilometers) north of the city. It was founded through a special relationship with the University of London and it opened its doors to its first students in 1952. The pink-hued Eastgate Centre, with its distinctive chimneys. The Eastgate Centre, which is a shopping center and office block in central Harare, that is designed to be ventilated and cooled by entirely natural means, it was probably the first building in the world to use natural cooling to this level of sophistication. It opened in 1996 on Rubert Mugabe Ave and Second Street. The National Gallery of Zimbabwe, which has a collection of European paintings as well as traditional and contemporary African art. Mushandirapamwe Hotel, which is a hotel at Machipisa Shopping Centre in the Highfield district. It is owned by the Tawengwa family, sons of George Tawengwa, a prominent Zimbabwean businessman who was the first black person to buy a farm in 1960. 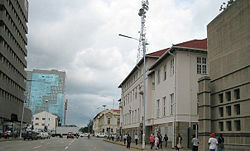 Harvest House, which is a six story building in Harare, located at 44 Nelson Mandela Ave and Angwa Street, and serves as the National Headquarters of the Movement for Democratic Change party. Sam Nujoma Street, which is one of the main streets of the city, was originally called Second Street, but this was changed to Sam Nujoma Street after Sam Nujoma, a former president of Namibia. Rufaro Stadium, which is a multi-use stadium, used mostly for football matches, and has a capacity of 35,000 people. Harare is Zimbabwe's capital and largest city, as well as its administrative, commercial, manufacturing, communications, and educational center. Along with the country, Harare's fortunes rise and fall with the successes and failures of its government. In 2008, Zimbabwe had an unpopular government that seemed powerless when dealing with the nation's problems. However, there is a strong foundation in education as well as abundant natural resources, both of which can propel future prosperity. ↑ Africa Stage, So Who Was Shaka Zulu—Really? Retrieved November 30, 2008. ↑ Charles Rukuni Bulawayo, May 17, 2006, Zimbabwe: It's Chombo's Fault, Financial Gazette. Retrieved November 30, 2008. Horn, Nancy E. 1994. Cultivating Customers: Market Women in Harare, Zimbabwe. Women and Change in the Developing World. Boulder, CC: Lynne Rienner Publishers. ISBN 9781555874728. Kamete, Amin Y. 2002. Governing the Poor in Harare, Zimbabwe: Shifting Perceptions and Changing Responses. Uppsala: Nordiska Afrikainstitutet. ISBN 9789171065032. Rakodi, Carole. 1995. Harare: Inheriting a Settler-Colonial City, Change or Continuity? World cities series. Chichester: J. Wiley. ISBN 9780471949510. Tingay, Paul, and Roger de la Harpe. 1997. Harare. London: New Holland. ISBN 9781868258901. World Fact Book. 2008. Zimbabwe. Retrieved November 25, 2008. Yoshikuni, Tsuneo. 2007. African Urban Experiences in Colonial Zimbabwe: A Social History of Harare Before 1925. Harare: Weaver Press. ISBN 9781779220547. This page was last modified on 8 August 2016, at 21:02.